Changbai Mountain Sika Deer antler. Only the top 1" of tips. Yang Jing and Yin Jing tonic. A close up view of what the sliced deer antler tips look like. The Sika Deer antlers are smoother than the fuzzy antlers of the Mallow deer. 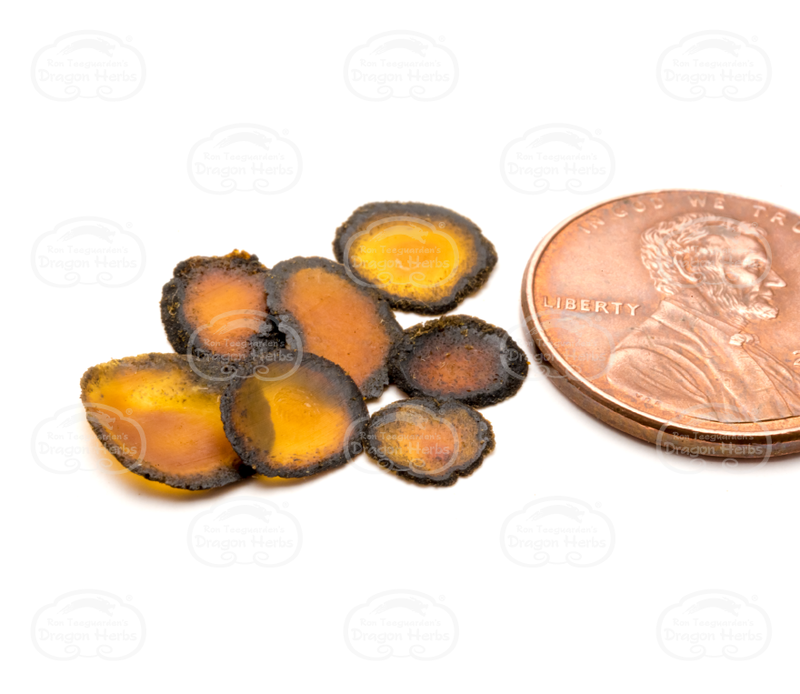 You know you are getting the right stuff as deer antler tips are very small, even smaller than a penny sometimes. 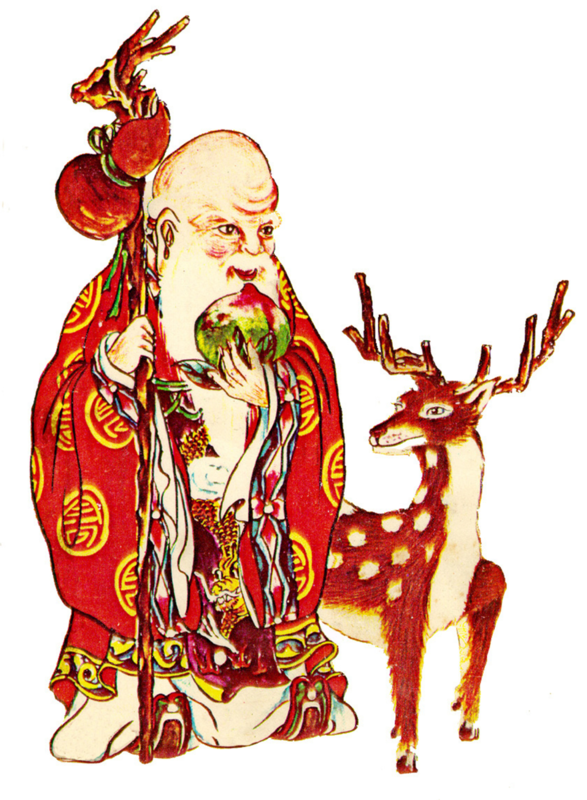 Magu is pictured with two different kinds of deer. The Mallow deer and the Sika deer. Dragon Herbs Changbai Mountain Deer Antler Drops is made exclusively with antler from Sika Deer, long considered to be the best deer antler. 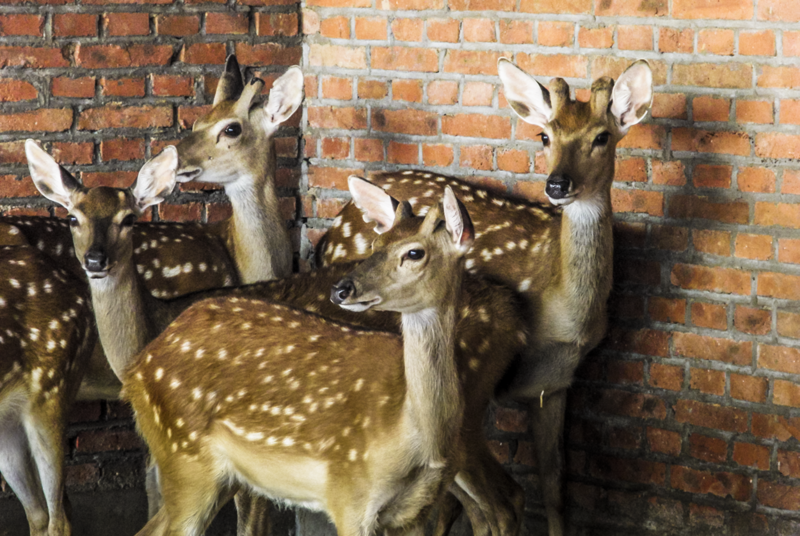 These are small spotted deer that are native to Northeastern Asia. This is the most valuable antler in the world. Deer Antler is considered to be one of the “big three” ultimate “herbs” (dietary supplements) of China — Ginseng, Reishi Mushroom and Deer Antler. Deer Antler supports normal healthy life functions so as to promote wellbeing. Deer Antler is a Yang Jing tonifying herb, and it also tonifies Yin Jing, Qi, Blood and Shen. It therefore tonifies all three Treasures. Deer Antler is used by athletes to support muscular strength. Deer Antler is suitable to both men and women. Deer Antler extract contains hyaluronic acid, a natural substance, also produced in the human body, that maintains elasticity of the skin and connective tissue. 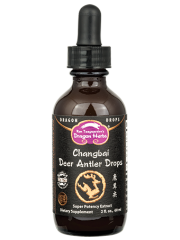 Dragon Herbs Changbai Mountain Deer Antler Drops is a unique product in the U.S. market. There are dozens of other “deer velvet” products available, but Dragon Herbs Changbai Mountain Deer Antler Drops is the ONLY product made ENTIRELY from Deer Antler tips. Deer Antler grows from its “tips.” As it grows, the soft body of the antler hardens, while the growing tip remains soft and bio-chemically rich. It has been estimated that 90% of the biologically active constituents of the ENTIRE antler is contained in just the last inch of the antler, known as the “tip,” even if the antler is 18 inches long. Dragon Herbs deer are farmed in beautiful, pristine Changbai Mountain, and are certified by the Chinese Ministry of Health to be clean and safe. Since the deer are so valuable and since deer antler is essentially a renewable “resource,” deer are highly protected. They thrive under the conditions established. The antler is painlessly cut off the live deer when the antler has developed either two or three branches and covered by “velvet.” Dragon Herbs uses only the distal one inch of the antler to make this product. The deer from which the antlers are collected are humanely treated at all stages of their life. They are very well fed, are allowed to graze freely in the foothills during the daylight hours, are protected from predators and are not harmed during the collection of their antlers. They are constantly monitored for their health. After the antlers are collected in May and June, the antlers regrow during the same growing season and are allowed to grow out fully. “Antler harvesting” has been proven to improve the life span of the male deer, which become somewhat less aggressive during mating season (fall and winter) and less prone to fighting and killing each other for the females. As a result, most male deer that have their antlers removed in the spring do not die from rutting, whereas the death and injury rate in the wild is very high. Female spotted deer do not produce antlers. Reinforces Kidney Yang, tonifies Yin Jing, tonifies Blood. Tonifies the Du Mai. Regulates the Chong Mai, Ren Mai, and centers the Dai Mai.Fortifies bone & connective tissue. Nourishes bone marrow. Enters the Kidney and Liver meridians. Warming. Adults who wish to increase primal Yang energy. Deer Antler is considered to be one of the "big three" ultimate "herbs" (dietary supplements) of China - Ginseng, Reishi Mushroom and Deer Antler. All three are tonic herbs that have been used since pre-historic times to prolong life, improve energy, to protect the body and to promote wisdom. They are not used to treat any kind of ailment, but to support normal healthy life functions so as to promote wellbeing and longevity. Deer Antler is a Yang Jing herb, but it also tonifies Yin Jing, Qi, Blood and Shen. It therefore tonifies all three Treasures. Deer Antler extract is considered to be the most powerful Yang tonic dietary supplement and is usually the main herb in any formula in which it is included. Deer Antler is used by athletes to support muscular strength. Deer Antler extract is consumed as a dietary supplement. 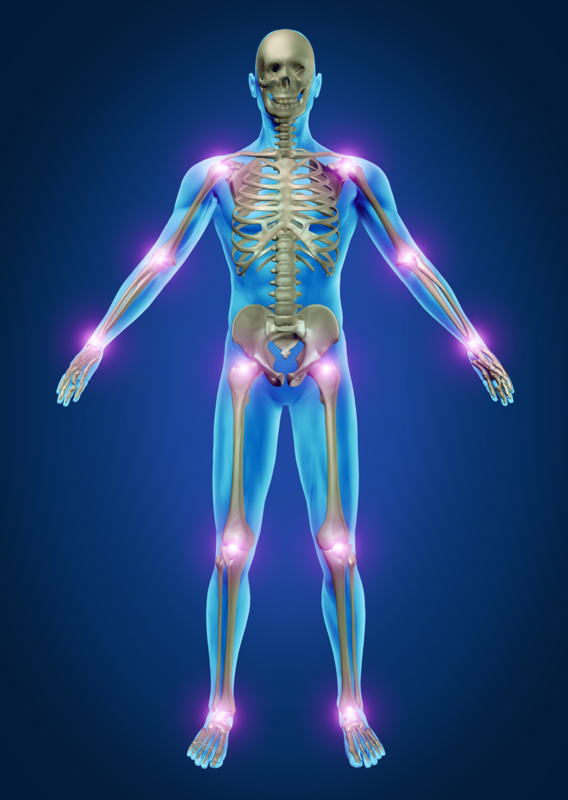 Deer Antler extract is used to support the skeletal structure, especially the back, knees and other joints. 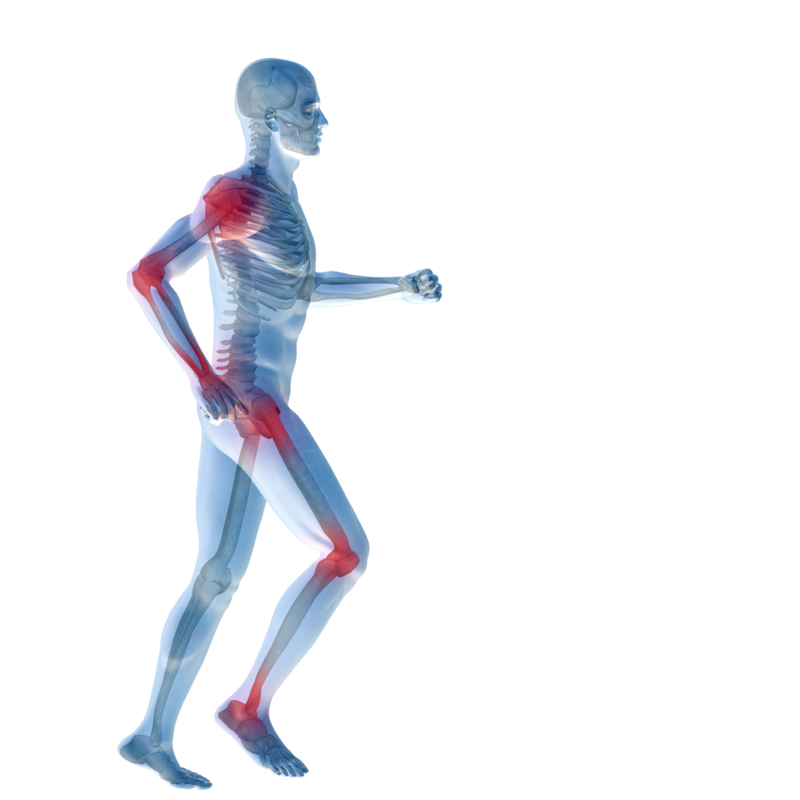 Deer Antler helps support cartilage and joint function. Deer Antler is also well known as a sexual tonic for both men and women. Deer Antler is suitable to both men and women, though men will generally consume Deer Antler in larger quantities. It is a Yang tonic that helps restore and maintain sexual vigor and performance. It may be particularly effective for older men and women. There are dozens of other "deer velvet" products available, but Dragon Herbs Deer Antler products are the ONLY products made entirely from Deer Antler tips. What does that mean? And what does that mean for you? Deer Antler grows from its "tips." 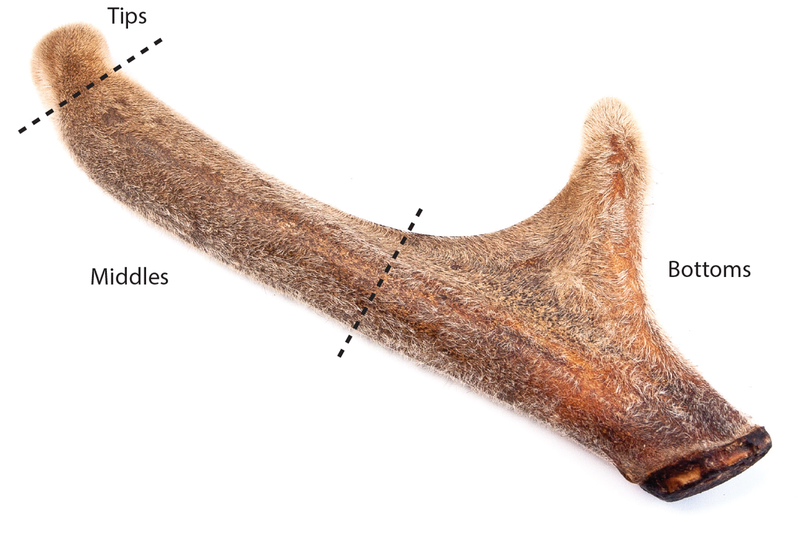 As it grows, the soft body of the antler hardens, while the growing tip remains soft and bio-chemically rich. It is just like the fresh leaves at the tip of a growing plant. It has been estimated that 90% of the biologically active constituents of the ENTIRE antler is contained in just the last inch of the antler, known as the "tip," even if the antler is 18 inches long. The tip of the antler is of course more expensive than the lower parts of the antler, because those deep into the trade know that this is the most valuable part. This has been true for a thousand years. However, since the tip contains most of the active constituents of the entire antler, it is in fact a fabulous value. It may cost three times as much, but it is at least 10 times as potent. Again, Dragon Herbs ONLY uses tips (the soft last inch of the deer antler) to make all its Deer Antler products, including Deer Antler Drops and Deer Antler Supreme Drops. We never use the "middles" or "bottoms" of the antler since these parts are hardened, dry and lack the chemical components that make Deer Antler biologically active in humans. Unfortunately for consumers, other companies are now putting the word "tips" on their description of deer antler. They are doing this in response to Dragon Herbs educating the public about the differences in deer antler products. However, they show no evidence of actually using tips. Dragon Herbs Deer Antler Drops are made from the tips only. However, there are grades even among the tips, acknowledged by herbalists and deer antler connoisseurs. Currently, due to our good fortune, Dragon Herbs only uses Sika Deer to produce all its Deer Antler products, including Deer Antler Drops and Deer Antler Supreme Drops. From these Sika Deer, we only use tips cut from the last 3/4 inch of the antler to produce Deer Antler Drops. This is why Dragon Herbs Deer Antler Drops is a unique deer antler product in the American market. Dragon Herbs deer are farmed in Changbai Mountain, and are certified by the Chinese Ministry of Health to be clean and safe. Since the deer are so valuable and the deer antler is essentially a renewable “crop,” deer are highly protected in all Asian countries. They thrive under the conditions established. The antler is cut off the live deer when the antler has developed either two or three branches, yet remains relatively soft (depending on the part of the antler) and covered by “velvet,” usually in the month of June in China. Because the antlers that do grow into the fall are smaller, the male deer tend to fight considerably less. The life expectancy of the male deer from whom the antler are collected is significantly longer than that of wild deer, who often die as a result of excessive male-with-male libido-driven fighting and from starvation. Far more of the male deer mate as a result of this process, which makes them very happy indeed. 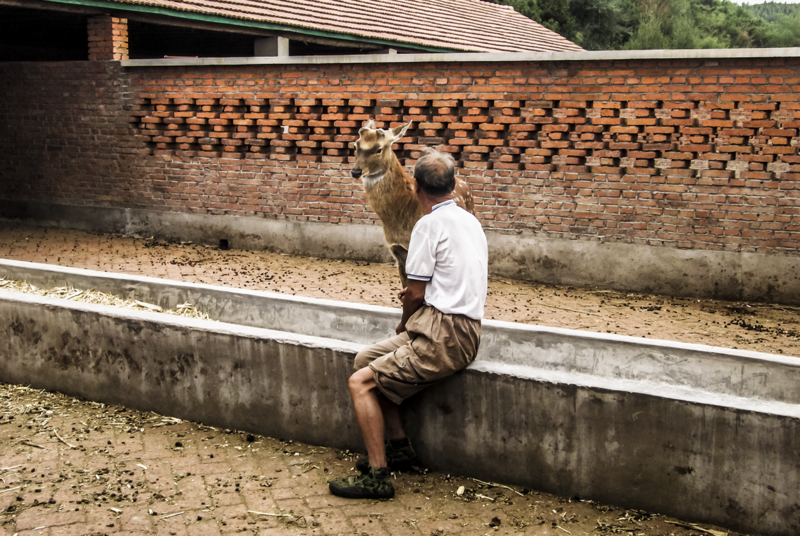 Deer are highly valued in the Chinese culture and are respected and loved by their care givers. 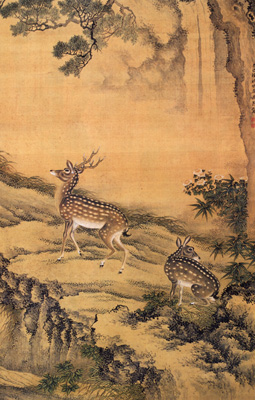 Deer are considered in Asia to be a "higher order" animal. Selecting high quality deer antler is an art. There are many sources, grades, cuts and qualities -- and there are counterfeits. The antler plays a major part in male sexual role of the male deer. Larger antlers are produced by deer that are more sexual and this deer antler is more potent. However, size alone will tell you only a little about the quality of a selection of deer antler. Dragon Herbs has used the same established source of deer antler tips for many years. Deer Antler can have a number of origins. Deer Antler entering the American market may originate in China, Russia, Mongolia, Alaska or New Zealand. All of these places have robust Deer Antler businesses. They all produce excellent deer; however, the quality will differ depending on the processing and the variety of deer. Sika Deer is considered to be the best deer antler, but it is rare. 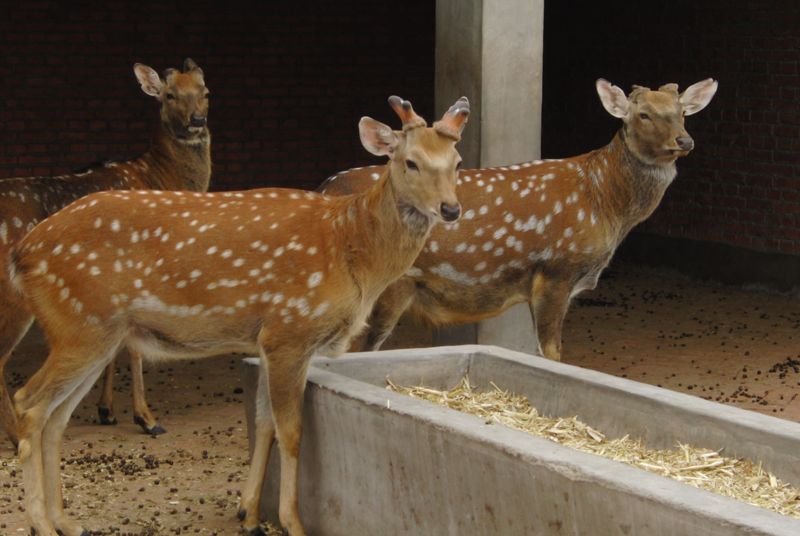 These are small spotted deer that are natural to northeastern Asia. This kind of deer has been absolutely revered in Asia for its deer antler since ancient times. Over hunting reduced the supply to nearly zero, but they are now humanely farmed in northeastern China and their antler is again available in limited quantities. This deer is also known in China as the "spotted deer" and as the "flower deer," since their white spots are actually shaped like a flower. 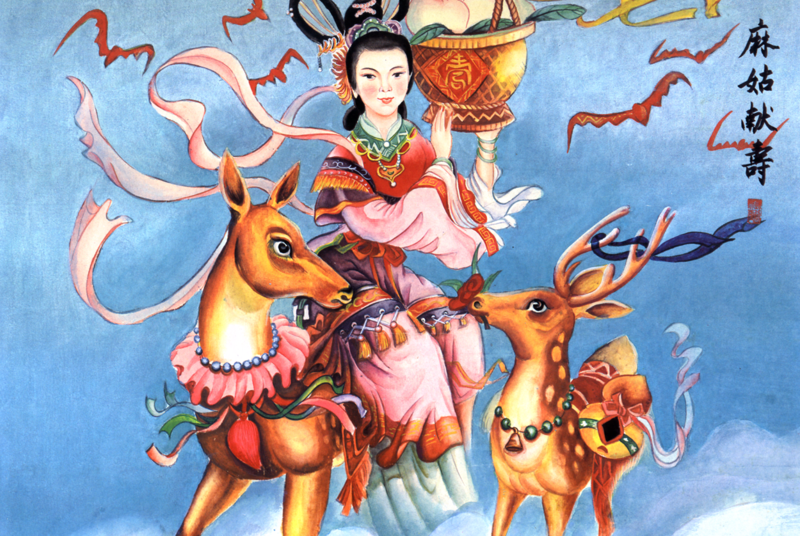 You will see the Sika deer alongside Shou Lao, the God of Longevity, in old Chinese paintings, and also alongside Magu, the Goddess of Youth and Beauty. The symbolism is obvious. The Sika is a small deer and its antlers are likewise small. But small is not the issue, potency is. These deer are extremely well cared-for. This is the most valuable antler in the world. Mallow Deer, also known as the "horse deer," is another popular variety of deer from which their antler is harvested. This is the most common variety of deer antler available in China. It is very good (but not as good as Sika deer antler). 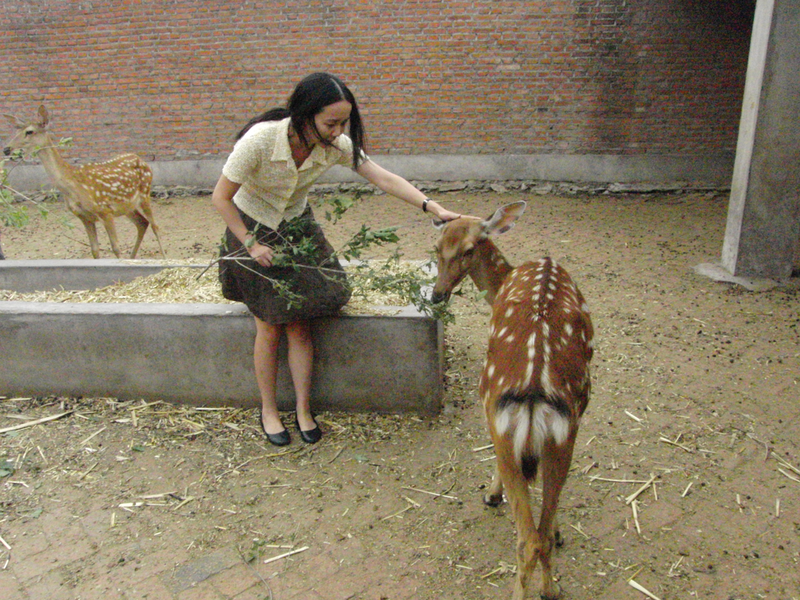 Mallow deer farms are abundant in northeast China. 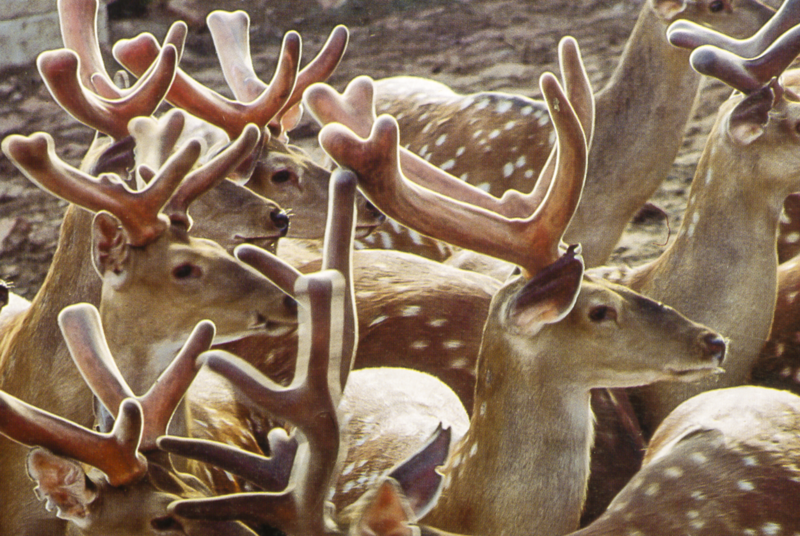 These very hardy, very large deer (thus the name "horse deer") produce large antlers and therefore are valuable to the farmers on a pound-by-pound basis. These deer are well cared-for. Dragon Herbs has established a permanent relationship with a Sika Deer cooperative in Changbai Mountain. Currently, due to our good fortune, Dragon Herbs only uses Sika Deer to produce all of its Deer Antler products. And from these Sika Deer, we only use tips cut from the last 3/4 inch of the antler to produce Deer Antler Drops. Are deer harmed in the making of Deer Antler? How are they treated? Harvesting our Deer Antler tips is done with care and compassion for the animal. 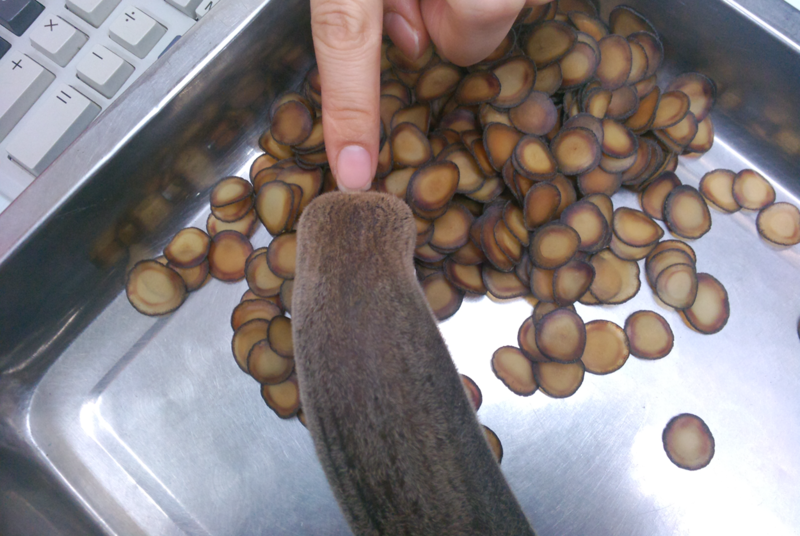 The antlers are anesthetized before being removed to prevent pain and provide protection until they are healed. Deer Antler tips is composed of pure stem cells that promote growth and blood production. Its chemistry provides benefit to humans by restoring pure Jing, through the bone marrow, to the whole system through enhanced and balanced cell production. Deer Antler is harvested once a year, before the antlers have completed calcification and hardening. The deer tips that are processed, while fresh, extract differently than when processed later in the year, when the slices are drier, with all the nutrients more deeply embedded. Consequently, different extractions may have different thicknesses. Extractions made in the spring will take fewer tips as the nutrients are more readily available, sometimes in a 4:1 proportion. Later in the year, DH may use twice that amount to get the same density of liquid, up to an 8:1 proportion of herb to liquid. Adjustments are made up to the level of concentration that still allows the product to flow from the dropper without clogging. 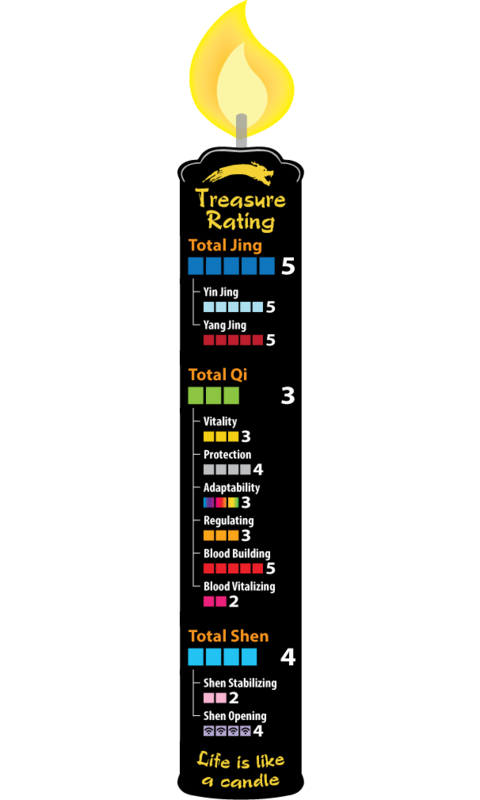 This is the Natural Yield amount, based upon the range found in nature and according to the seasons. Besides Deer Antler, there is also something called Deer Velvet. What’s the difference? The only distinction, we are talking about the tips with Deer Antler. Deer Velvet is another name for Deer Antler. Dragon Herbs uses the last 0.5-1 inch of the antler because it has 95% more effective sapones. Most deer antler extract from other brands do NOT use the tips, they use the middle section of the deer antler, which contains much less active components, and almost no stem cells. What happens to the deer after they mature past the antler harvesting window? After harvesting the antler, the deer then grow new antlers as the season progresses and this second set of antler is not harvested. Are the deer used for Deer Antler Drops tested for livestock diseases including mad cow disease? Dragon Herbs deer are farmed in Changbai Mountain, and are certified by the Chinese Ministry of Health to be clean, safe and free of any disease pathogens. My Deer Antler Drops turns into a solid gel. Is it normal? Yes, this only means that the batch is thick and creamy. Usually it would de-gelatinze if put in warm water? In cold weather, Deer Antler Drops may become very thick or gel up. Again, it is a matter of temperature, so warm up the bottle and it will turn back into Drops. 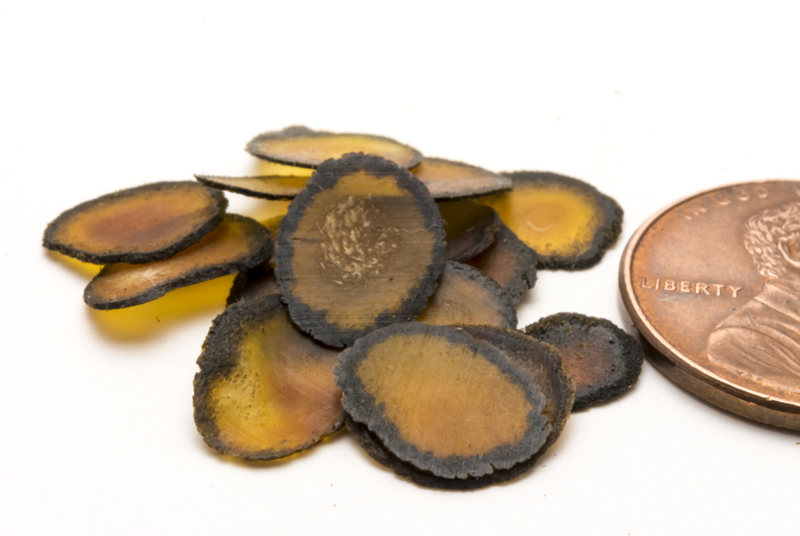 Studies conducted in Europe indicate that the ability to regenerate is partially due to the rich supply of substances known as ectosaponins. These complex chemical agents are found more abundantly in lower animals, in which the ectosaponins cause a wide variety of tissues to regenerate. The ectosaponin in deer antler is very similar to ectosaponins found at the tail bases of many lizards, such as the Gecko lizard, and in the legs of star fish. If the tale is broken off a Gecko or similar lizard or the appendages broken off a starfish, these appendages re-grow - bone, connective tissue, nerves, blood vessels, flesh and all (no bones in star fishes). 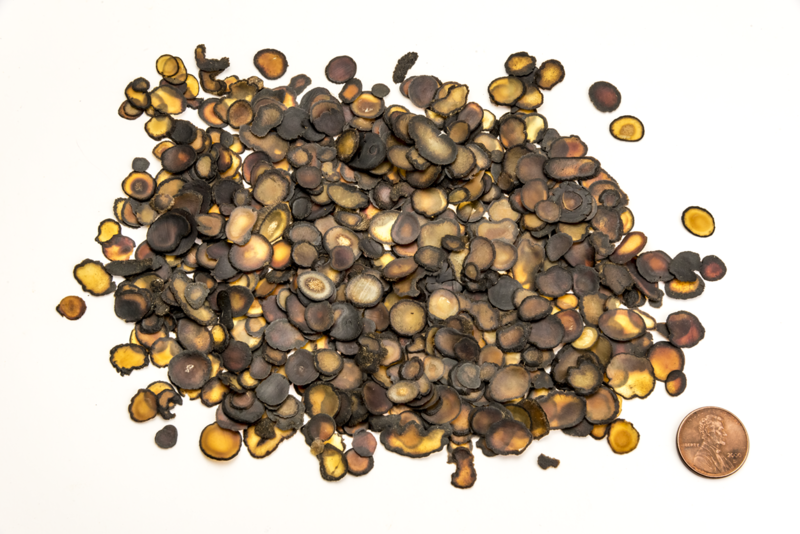 The ectosaponins extracted from deer antler, as well as from Gecko and star fish all have shown remarkable regenerative effects on all types of tissue, including nerve tissue, which generally does not regenerate significantly.